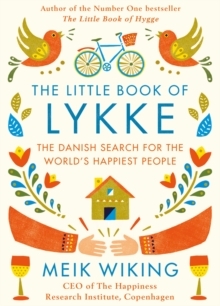 **From the author of the international bestseller The Little Book of Hygge -- over one million copies sold**Lykke (Luu-kah) (n): HappinessMeik Wiking is the CEO of the world's only Happiness Research Institute in Copenhagen. His job is to travel around the world, seeking out the happiest people and uncovering what they do differently. In The Little Book of Lykke, he reveals what he has found. This captivating read features case studies from Bhutan to Australia, South Korea to Canada, France to Denmark, taking the reader on a happiness treasure hunt.